Fiber Flux: Free Crochet Pattern...Ginger Snap Infinity Scarf! 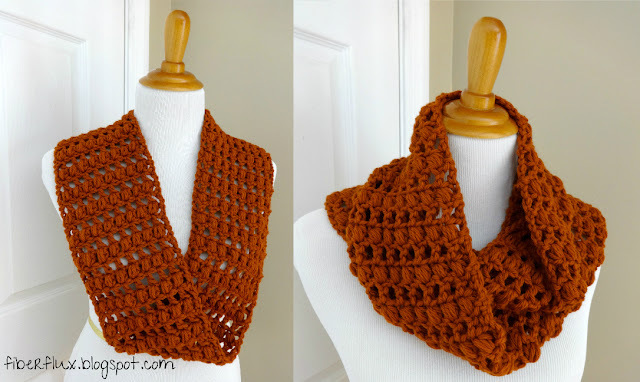 Free Crochet Pattern...Ginger Snap Infinity Scarf! 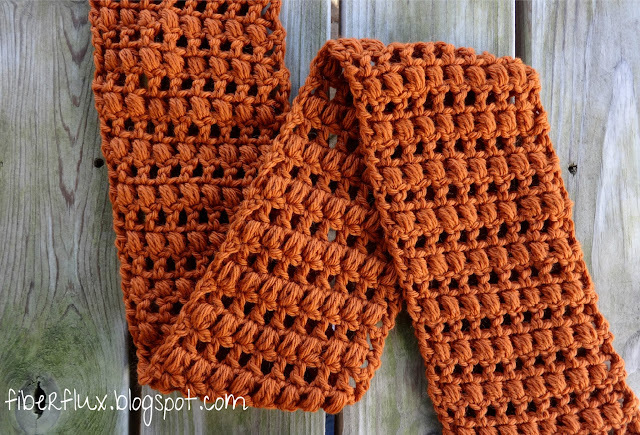 The Ginger Snap Infinity Scarf is warm and toasty like a wonderful ginger snap cookie. 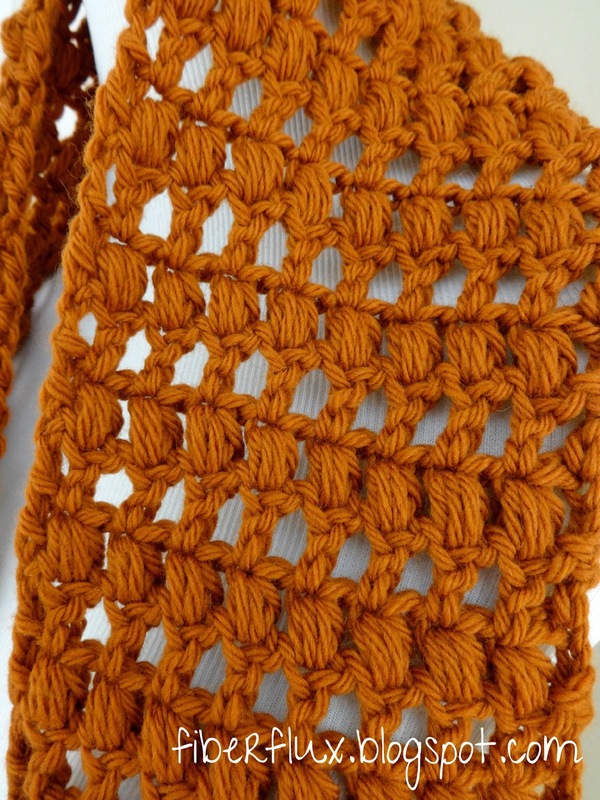 Worked in alternating rows of puff stitches and double crochet stitches, this scarf makes for an interesting texture and visually appealing stitch sequence. Foundation Row: In the fourth ch from the hook, work a (puff stitch, ch 1). *Skip 1 ch and in the next ch, work a (puff stitch, ch 1). Repeat from * until you have two chains left. Skip the second to last ch and in the last ch, work 1 dc. There should be 8 "puffs" on this row. Row 1: Chain 3 and turn. Work a (dc, ch 1) in the top stitch of each puff from previous row, for a total of 8. Work a dc in the top stitch of the turning ch. Row 2: Chain 3 and turn. Work a (puff stitch, ch 1) into each dc from previous row, for a total of 8 puff stitches across. Work a dc in the top stitch of the turning ch. Repeat rows 1 & 2 until scarf is desired length. Weave in all ends and seam the ends to make a long loop. 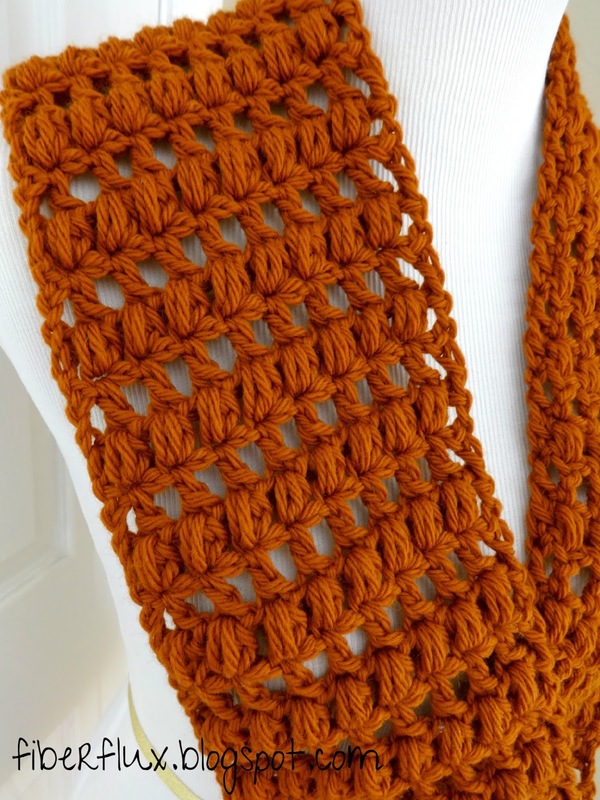 Alternatively, you could skip the seaming and make it a traditional scarf. Jennifer, another beauty, I love the puff stitch. Hi, Meredith. 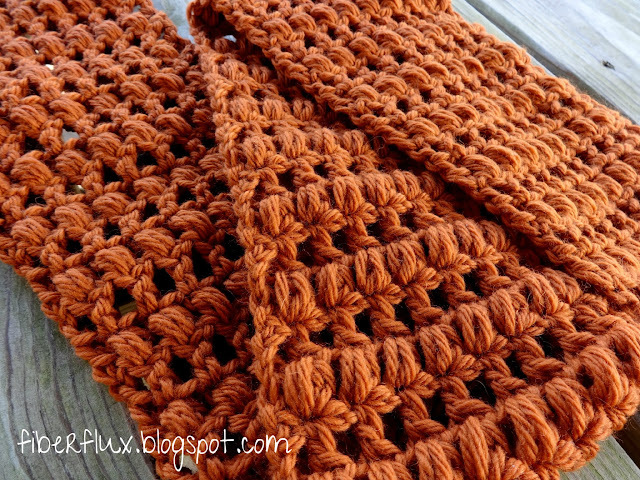 Can you explain to me what a puff stitch is? Is it a shell? A half shell? Thanks. Just in time for the holiday push! Did you twist it before sewing the ends together? I made this in a shorter version and it makes a lovely cowl . The puff stitch adds some nice interest. However, I was a bit unclear on where to put my DK and the pattern ends up being not quite as straight on as the picture, It seems the "hole" I DK in was not directly top of puff. Can you give me some feedback ?? Hi! I like your crochet pattern infinity scarf. The color is lively and the style of it. 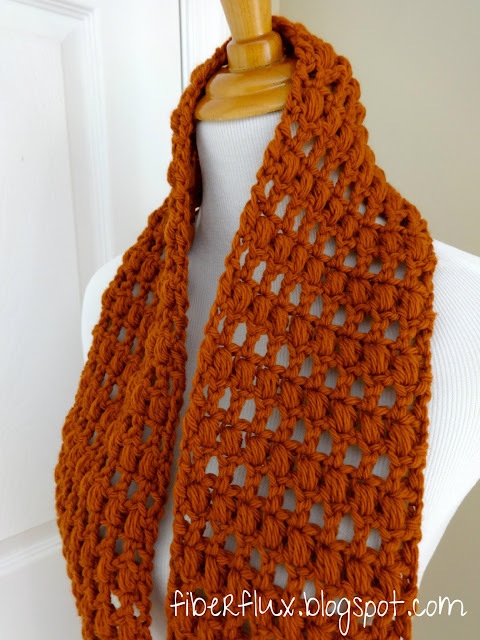 I hope to learn how to knit, so I can make my own infinity scarf. Hopefully, we can get in touch to one another if I need any help. Thanks for sharing! I enjoyed your video tutorial, thanks! I have become a regular visitor on your blog. Your scarves are absolutely beautiful and easy to follow patterns. I am making 6 scarves for 6 of my college buddie whom I am going to see at a reunion in Feb. You videos are so helpful and instructions very easy to follow. Thank you very much for the hard work you have put into creating the patterns and letting us use it. Thanks and keep them coming. Can this pattern be crocheted in the round? I'm just curious as to how many rows you did. This is a beautiful pattern by the way! !